Whether your business has one office or several locations in the same city or around the world, Sage 300cloud provides the features and flexibility you need to manage accounting, finance, operations, and inventory in multiple languages and currencies. The preferred software for tens of thousands of companies around the globe, Sage 300 is one of the most widely-used ERP solutions for small and mid-sized businesses. Modern Web Interface – Sage 300cloud looks and works like other web applications you already use so you’re up a running quickly with a shorter learning curve than many other ERP products. Mobile Access – because it’s web-based, Sage 300clould works on just about any device so you have access to business and transactional data in the office or on the road. Flexibility and Power When You Need It – whether you run a small neighborhood business or multiple companies that span the globe, the features and modules of Sage 300cloud will scale your business grows or changes. Advanced Inventory Management – take control of your inventory with advanced features for purchasing, order processing, shipping, receiving, returns processing, and multi-warehouse management. You’ll also improve inventory forecasts and optimize stock levels using Sage Inventory Advisor. 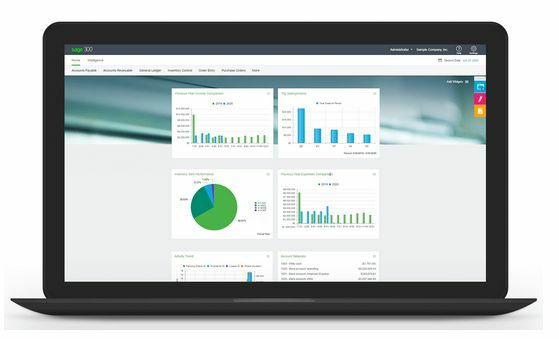 More Intelligence Reporting – make more timely and informed business decisions using the real-time data and analytics provided by the built-in business intelligence reporting features of Sage 300cloud. Does the software run in the cloud? Sage300cloud runs through a browser or classic desktop is still available. You can install on your server, data center or request Sage300cloud to be hosted. What’s the difference between Sage 300cloud and the former “Accpac” or “Sage 300 ERP”? Sage has had a lot of name changes over the years. The core features and database names are still very similar but the user interface and extended features have had significant changes. If you used Accpac in the past you will be surprised by the new features and pleased the core features have remained. How is Sage 300cloud priced? Pricing is subscription and based on per user. There are 3 additions available based on functionality needed; Standard, Advanced and Complete. No Downloads, No Installations. It only takes a few minutes to get started! Try before you buy. Simply complete the form and you will receive your login information along with detailed instructions to access your Sage software demo account. Want to determine if Sage 300 is right for you? Let us help you define your system needs. Please feel in the form to learn more.